Participating in sports and physical activity results in about 40,000 eye injuries in the United States each year. Most of these occur in kids, and about ninety percent of them are avoidable. When it comes to eye injuries, sports can be classified as low, high and very high risk. Some low-risk sports include track and field, swimming, gymnastics and cycling. High-risk sports use a ball, puck, bat, stick, racquet or body contact. Very-high risk sports include boxing, wrestling and contact martial arts. There are three common types of eye injuries: blunt trauma, penetrating injuries and radiation injury from sunlight. Blunt trauma occurs when something hits your eye and can result in bruising or a “black eye”. Penetrating injuries occur when something cuts your eye. This can range from a scratch to glass penetrating inside your eye. Lastly, radiation injuries are caused by exposure to the sun (ultraviolet light). Do not try to treat the injury yourself or remove something from your eye. If you have a scratch, it may feel like you have an eyelash or other foreign object in your eye. Do not touch, rub or apply pressure to your eye because that can make the injury worse. Do not remove the object from your eye if it is stuck, and do not apply ointment or medication to the eye. When you visit a sports medicine physician, he or she will examine your eye and provide treatment options. They will first perform a funduscopic exam with an ophthalmoscope. Your doctor may need to place drops in your eyes to better visualize the structures inside the eye. You may also require removal of an object or flushing of your eye. Depending on the severity of your eye injury, your sports medicine physician may refer you to a specialized eye doctor called an ophthalmologist. Eye protection can help reduce the likelihood of an eye injury. It is recommended to use 3 mm polycarbonate lenses commonly found in safety glasses and goggles. These lenses are thin, lightweight and impact resistant. They come in basic or prescription forms. Sunglasses can also protect your eyes from radiation. 1. Rodriguez JO, Lavina AM, Agarwal A. 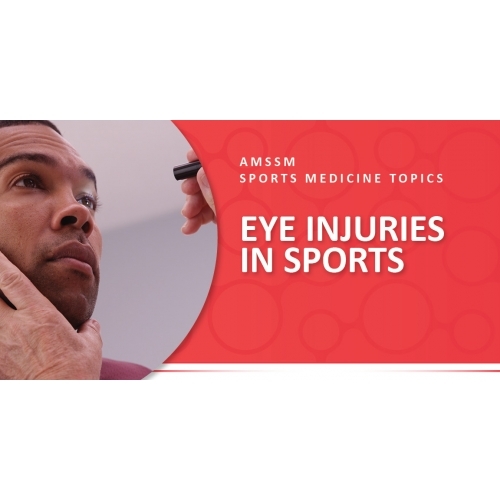 Prevention and Treatment of Common Eye Injuries in Sports. American Family Physician. 2003;67(1):1481-1488. 2. Micieli JA, Easterbrook M. Eye and Orbital Injuries in Sports. Clinical Sports Medicine. 2017;36: 299-314.